Please allow some time to load. At the beginning of 20th century, the allied Central powers (Austro-Hungary, Italy and Germany) made a contract about fighting together against possible mutual enemies (Great Britain, France and Russia - united in the Entente). Austria and Italy, however, could not forget their mutual rivalry, especially seen during the war in 1866, when Austrian army defeated Italian army several times and when the Austrian fleet defeated Italian fleet in the battle of Vis (Lissa) on July 20th 1866. Therefore, the news published in January 1908 in the German navy magazine "Marine Rundschau", saying that the keel of the first Italian dreadnought battleship was about to be laid resulted in a spontaneous Austro-Hungarian reaction. The Austrian commander of the fleet , admiral Rudolf Montecuccoli Polinago, had on February 20th 1908, during the meeting of parliament representatives, announced the building of battleships of 18 - 19, 000 tons of displacement. The first projects of the Navy - technical Committee in Pula comprised ships armed with 305 mm guns. The former chief constructor of the Austro-Hungarian Navy, ing. Siegfried Popper, considered these projects too weak. After his retirement in 1907, he continued working as a consultant at STT shipyard in Trieste, where he began making several projects of 20 - 25, 000 ton ships armed with 8, 10 or 12 305 mm guns, and a number of 150 - 190 mm guns in twin turrets. A drawing showing the armour and the guns on the Tegetthoff class battleships. After the official release of the information about the Italian dreadnought RN Dante Alighieri, the last Austro-Hungarian project was changed into a battleship armed with 12 guns of the main caliber (305 mm) in four turrets. The quick change of plans was possible because the company Škoda in Plzen was already working on a triple turret project, for Russian buyers. The installation of triple turrets on the new imperial vessels was solved better than on the Italian ships, as it was a combination of the American and Italian ideas. All four turrets were put in a straight line, one after another, and two of them were raised over the lower two, thus enabling them to fire over the lower turrets. 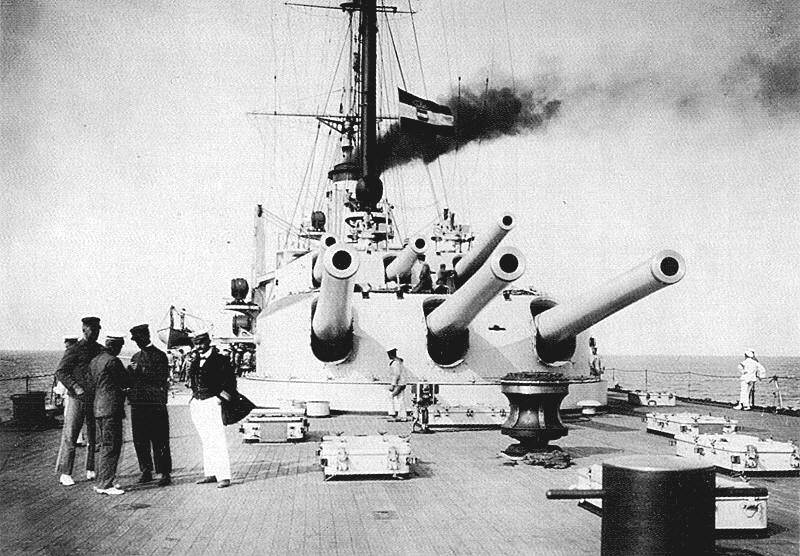 The British and German dreadnoughts were able to use instantaneously only 8 out of 10 or even 12 guns of the main caliber, which were placed in double turrets in a straight line and on the sides of the ships, while the new Austro-Hungarian battleships were able to use all of their guns on the sides and six over the bow or stern. With guns placed in such a way, the weight of the ships was reduced, as four triple turrets needed less armour than six twin turrets. 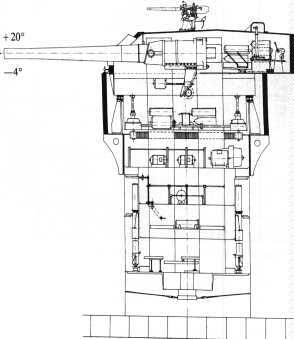 A drawing of a triple turret with 305 mm guns, used on Tegetthoff class ships. During 1909 Austro-Hungarian captain Alfred von Koudelka was sent to Berlin to make a research into the technical details of German battleships. He was allowed to examine the latest projects, which had excellent armour and underwater protection. Germans advised the Austrians to strengthen the underwater protection (against mines and torpedoes), make no watertight doors below waterline, increase the displacement of the ships to 21, 000 tons, and reduce the number of main guns from 12 to 10. It seems that Austrians did not even wait for Koudelka's report, as the project was chosen and the building of the ships approved before the report could have been read. The main constructor of the Tegetthoff class ships, ing. Popper, was retired due to poor eyesight. Therefore, many experts consider him responsible for the poor quality of the Tegetthoff class ships, as he was said to be almost blind during the construction of the ships. When the Hungarians were promised equal cooperation in the building of the fleet, the Hungarian parliament agreed to finance the new fleet programme in April 1911. The programme included 4 battleships, 3 cruisers, 6 destroyers, 12 torpedo-boats and 4 submarines. In order to fulfil the terms of a secret contract with the Hungarians, the Hungarian dreadnought was to be built in the Hungarian part of the Empire and using mainly Hungarian material (except guns, turrets and armour). The Hungarian access to the sea was in Rijeka, a Croatian town that Hungary annexed in the late 19th century. The shipyard Danubius in Rijeka had previously built only torpedo-boats and destroyers, but during April 1911 one battleship and two cruisers were ordered. The battleship was to be finished by July 30th 1914, but that was not possible, because the shipyard itself had to be built! Therefore, SMS (Seiner Majestat Schiff) Szent István was finished seventeen months after the agreed deadline, in the Navy arsenal in Pula, where it was hauled after the beginning of the World War I.
SMS Viribus Unitis in the STT shipyard in Trieste. The installation of the armoured deck is in progress. The main deck covered the ship from bow to stern at one level. This kind of a deck is called a flush-deck (Glattdeck). As the ships did not have a raised forecastle deck, which was done to save on weight, the ships had worse maritime capabilities than ships equipped with it. The ram was built onto the bow, which was normal for all larger warships of that period. The ram reduced speed and made steering more difficult. Also, the bow was equipped with a single torpedo tube. The superstructure was relatively small and low in order to make the ships less visible and harder to aim at. The funnels were 13.5 metres high and equipped with reflectors, which were supposed to be used at night for detecting torpedo-boats. The funnels were later covered with wire nets, due to danger of enemy warplanes dropping their bombs into the funnels. The number of air raids on Pula increased as the war progressed. The installation of the mast on SMS Viribus Unitis. The thickness of the armour on the hull varied from 150 - 280 m. The two protective decks were covered by armoured plates 30 - 48 mm thick. The underwater protection was too weak. 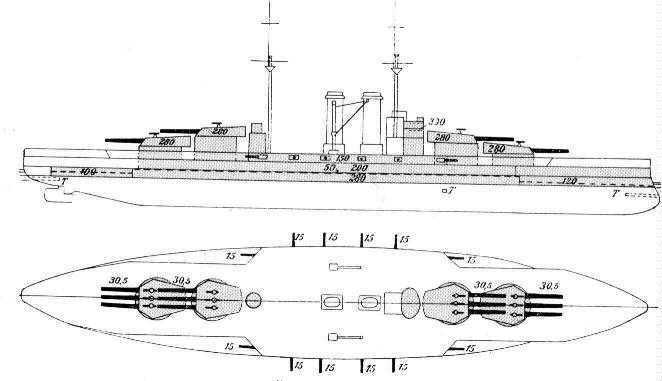 While on the German battleships of the period there was 4,5 metres inter space between the outer hull and the inner anti-torpedo bulkhead, the Austrian battleships of the Tegetthoff class had only 2.45 metres of inter space. German dreadnoughts had no watertight doors below the waterline and in order to get to another compartment, one had to use the stairs to get to the nearest watertight door above the waterline. However, watertight doors on the Austrian ships did not make them especially safe, due to the fact that the whole system was complicated and not practical in emergencies. Additional anti-torpedo protection was provided in the form of steel nets, placed around the ship. The plan of the armour protection on the Tegetthoff class battleships. The planned top speed was 20.3 knots, but on the sea trial the Viribus Unitis managed to achieve a top speed of 20,49 knots. The way in which the shafts were installed on the Szent István was unusual and worse than those on her sisters. The result was that the Szent István would start listing dangerously after turning the rudder for more that 10 degrees. Therefore, after her sea trial, sudden and more extreme changes of course were forbidden. SMS Szent István being equipped in the Danubius shipyard in Rijeka. Teakwood planks on the hull were intended to alleviate the impact of enemy shells. They were also used for attaching the armour plates. The torpedo tube opening can be seen on the lower part of the bow. Each of the 305 mm guns had weighted 54 tons and their shells 450 kg. There were 76 shells carried for each gun. A trained crew was able to fire a salvo every 40 seconds. The maximum range of the guns was 20, 000 metres. It should be pointed out that the German 305 mm guns of that period had the range of 16, 200 metres. Due to better visibility in the Mediterranean, the crow's nests were installed higher than on the battleships of the other navies. 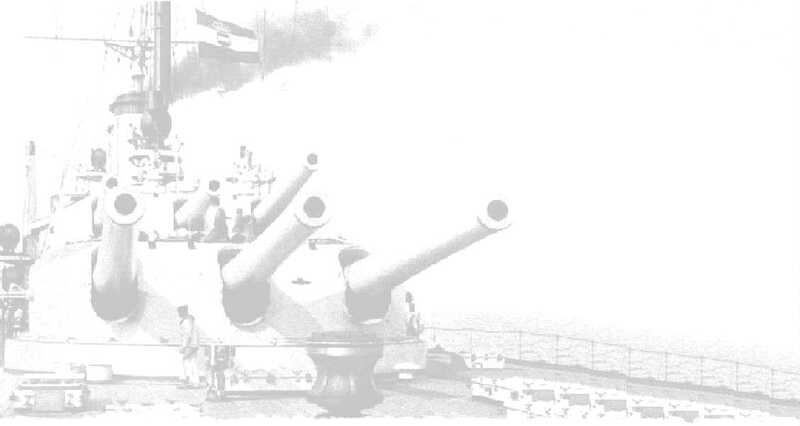 There were also twelve 150 mm guns (range: 15, 000 metres), twelve 70 mm guns (range: 5, 000 metres) to be used against torpedo-boats, and four 70 mm dual-purpose guns (anti-aircraft and surface). Two 47 mm and two 66 mm mobile guns were available for the landing support, as well as two 8 mm machine guns. The ships also had fourteen 533 mm torpedoes, with one torpedo tube even being installed in the bow. The ships could carry up to 20 mines. Aft triple turrets with 305 mm guns on SMS Prinz Eugen, July 1914. SMS Viribus Unitis, the first ship of the Tegetthoff class, was launched on June 24th 1911. The launch was attended by the grand duke Franz Ferdinand. He was supposed to be that day, with an older battleship (SMS Erzherzog Franz Ferdinand - Radetzky class), in Spithead, Great Britain, attending the naval parade organized due to the crowning of George V. However, due to the Morocco crisis, the less significant grand duke Karl (Charles) Franz Joseph attended the parade instead, with SMS Radetzky (which bore resemblance to Tegetthoff class ships). The Viribus Unitis was upon its completion made the flagship of the royal fleet (K. und K. Kriegsmarine). It was the first battleship in the world with triple turrets. SMS Prinz Eugen was launched in the same year, SMS Tegetthoff was commissioned in July 1913 and SMS Szent István on November 17th 1915. The four ships were in strategic reserve, and were leaving Pula only during target practice. Later in the war, any bigger naval operation in the Adriatic was impossible due to enemy mines and submarines. The Italian fleet was not in the Adriatic (it was in Taranto), and because of the loss of two armoured cruisers, sunk by German and Austro-Hungarian submarines, the Italian fleet also mainly stayed in its harbours. One of the reasons why the Austro-Hungary was so passive regarding naval operations was that there was a lack of coal. In 1914 there was around 500, 000 tons of coal in stock, but a lot of it had been spent and it was not possible to buy any abroad, especially the excellent Cardiff coal.